As you know I met up with two wheel travel, Carolyn and Tyler again. I wanted to knock off a week of travel using optional transportation: train, bus or ferry. The train ticket person said it would take 5 train changes. She advised against going by train, really? The bus was complicated too. 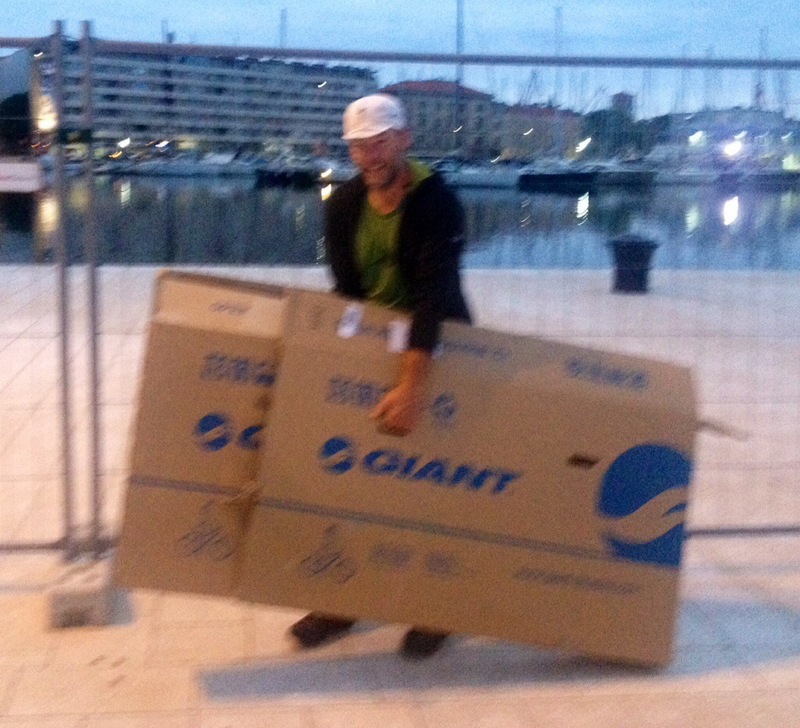 So there’s a ferry from Pula to Zadar, but “NO BIKES ALLOWED.” This is a very short sighted rule. When you consider the effects of climate change, encouraging cycling helps promote real “ECO” Tourism. 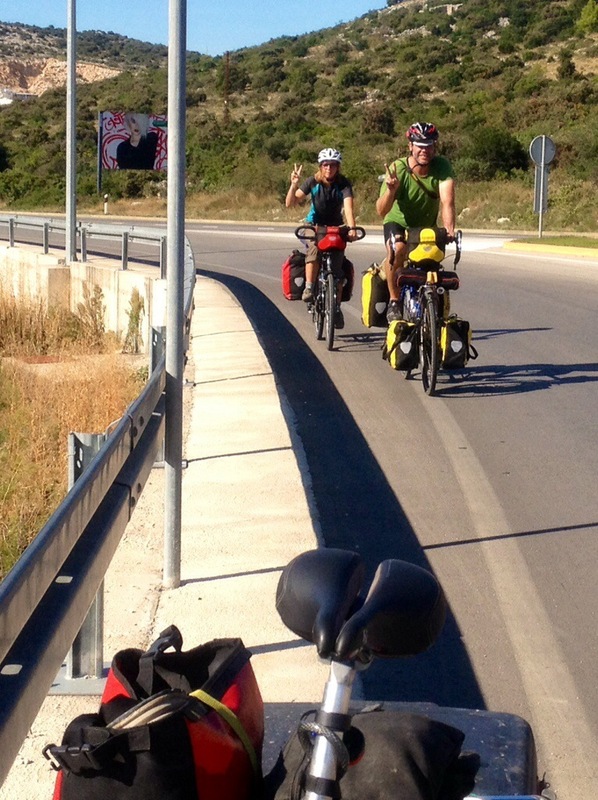 Biking is slower and you stay longer in a country, that’s good tourism. So while we were swimming I suggested to Tyler that we go back to the bike shop and get some boxes for their bikes and take the ferry. 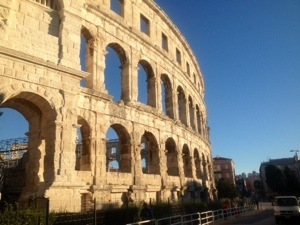 PULA HAS A CONCERT ARENA LIKE NIMES, FRANCE DID, AN OLD ROMAN ARENA. There are many great reasons to travel this time of year: no crowds, mild temperatures, cheap acomadation (I got a room for $18 a night). The roads aren’t real busy if your biking. 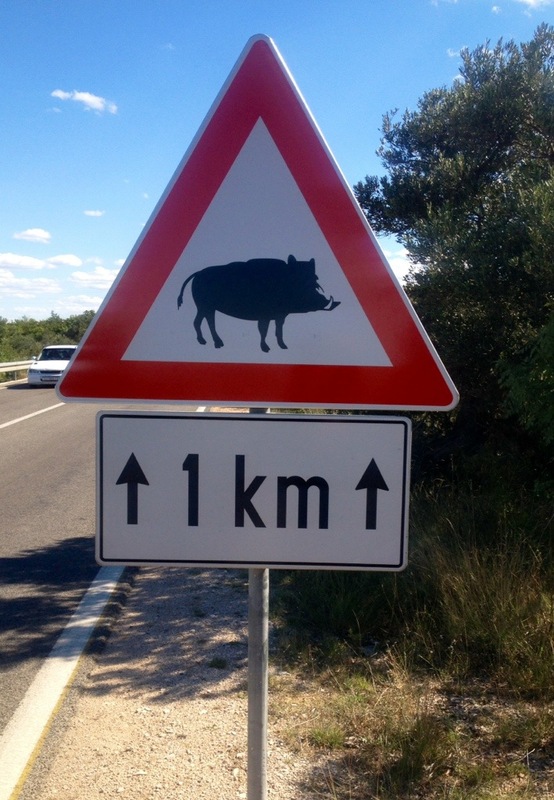 IT’S DIRECTIONS TO A BIKE LANE, (couldn’t find it?) BUT CUTE BIKE LOGO ON THE SIGN. The Croatian coast makes me think this is what Spain must have looked like 15-20 years ago. Biking at times has been a little dangerous. I’ve only been run off the road twice in 6 months, HERE? twice in one day. 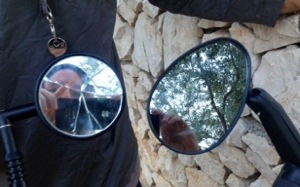 If your considering bike touring on a future vacation, PLEASE get a mirror for your bike. MY BIKE FELL OVER AND BROKE THE MIRROR, I HAD A CUSTOM MIRROR MADE ($7), AND IT BROKE ON THE FERRY RIDE THE NEXT DAY (this photo) AND MY NEW MIRROR. I only went an hour without a mirror, both times, That’a how important they are! 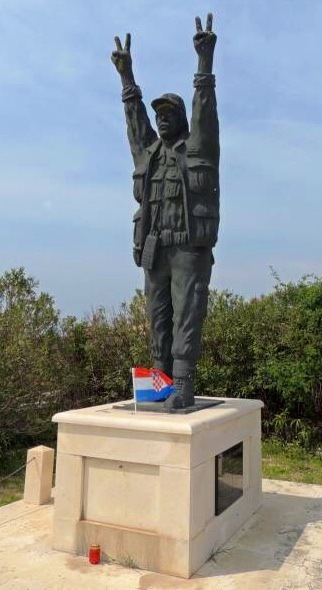 THIS IS “BOBAN” WHO SAVED HIS VILLAGE IN THE EARLY 90’S BY RAISING HIS ARMS AND GIVING THE VICTORY SIGN TO THWART ONCOMING TANKS. HE ONLY HAD A COUPLE OF FARMERS WITH RIFLES BACK IN THE WOODS. A PICTURE WITH ME WAITING FOR CAROLYN AND TYLER (a first). 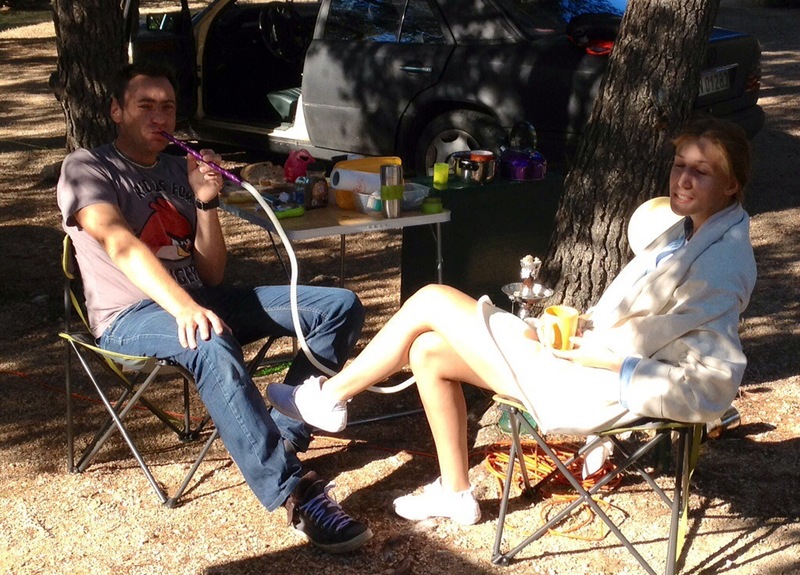 THIS IS A PHOTO OF SOME POLLOCKS SMOKING FLAVORED TOBACCO IN THE MORNING. I sometimes set my tent up without the rain fly. He asked me what do I do when it rains? Like Tyler said “It’s a submarine” or “I crawl underneath it” I thought he was joking, but I don’t think he knew some tents have rain fly’s. So during the night a cat got into my stuff. Tyler said he threw rocks at it and then tried to wake me. Next day at lunch I couldn’t find my cheese? CAT GOT IT! It was kinda funny because the next morning the cat came around purring and very friendly. The cat knew something I hadn’t discovered yet. It was a brand new block of un-opened cheese. THE VIEWS FROM THE ROAD WERE (ARE) AMAZING! 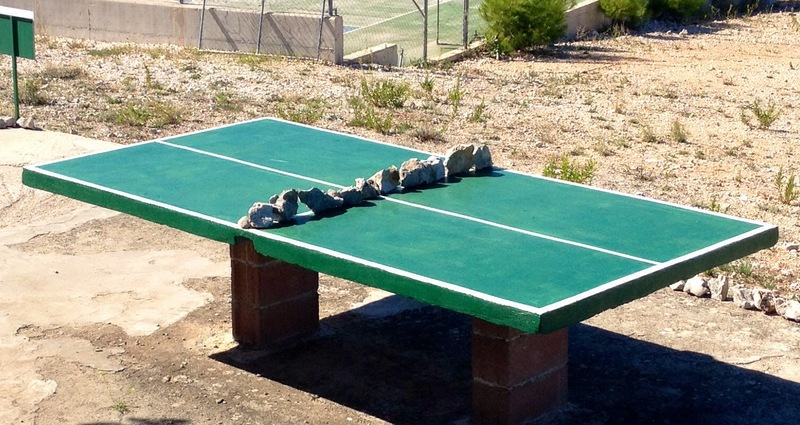 PING PONG NET MADE OF ROCKS! LOTS OF “GREEN” CARPORTS MADE OF, GRAPE, KIWI AND OTHER VINES. 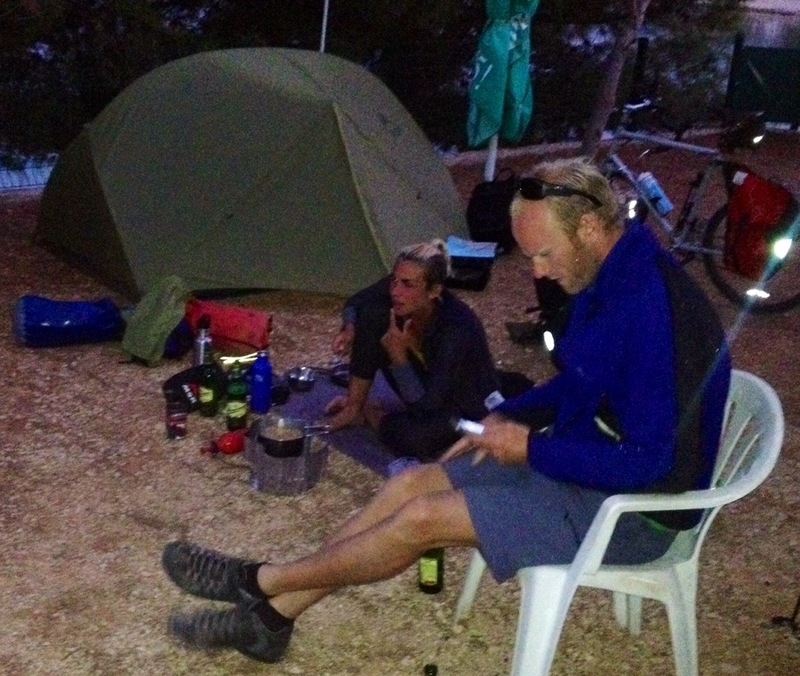 So we met several other cycling tourist, shared a campsite and had a great pot luck meal for 7. (2 french, 1 Scotland, 4 Americans). 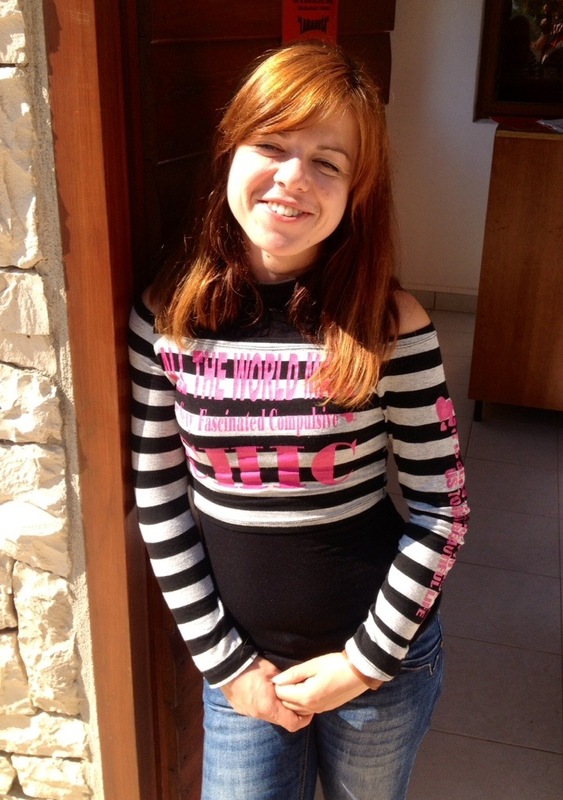 IT WAS THREE COUPLES AND ME (I left on my own the next morning) But not before taking this photo of our lovely camp host Sanja. 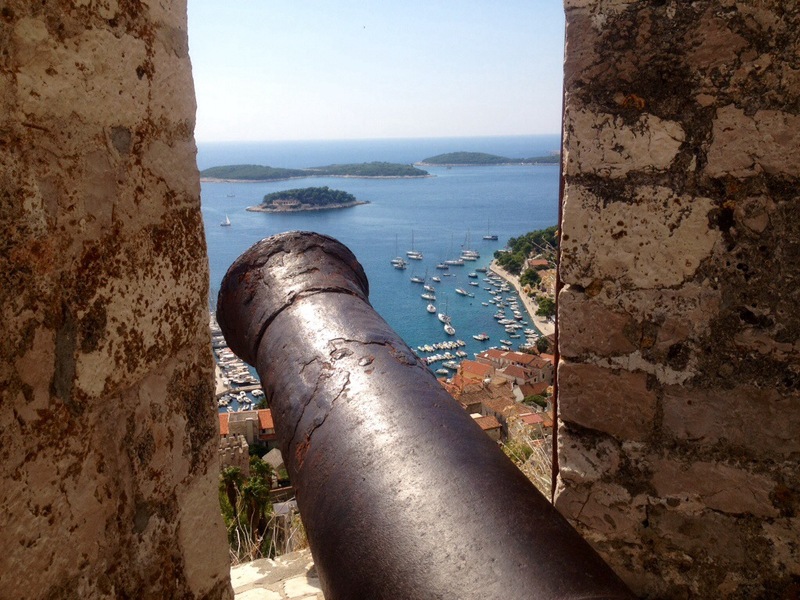 FORTRESS FORTICA IN HVAR IS A MUST SEE ATTRACTION. THE VIEWSARE SPECTACULAR! 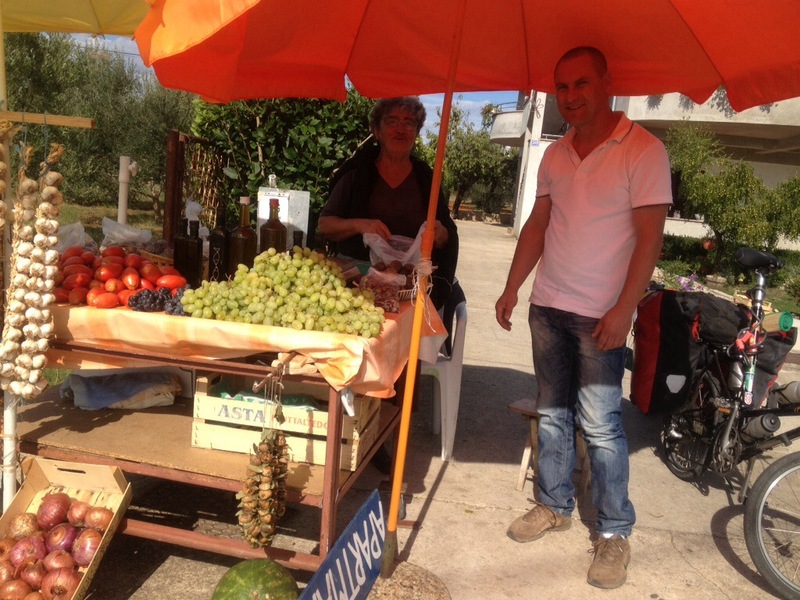 HVAR HAS SOMETHING FOR EVERYONE! 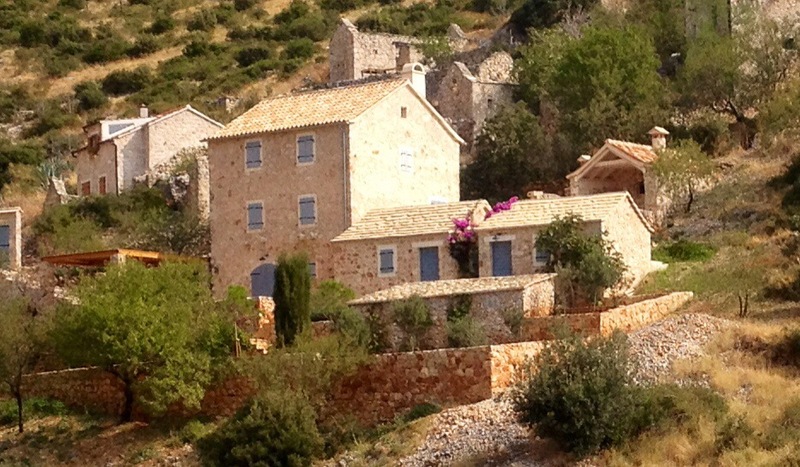 I stayed at DINKS PLACE in Hvar. I had the hostel to myself one night, private kitchen and bathroom, $20. DINK IS SHOWING ME HOW TO FLASH THE TWO FINGERS INSTEAD OF MY USUAL THUMBS UP SIGN. (what?) NICE NEW CROATIAN SOCCER SHIRT, JEFF. 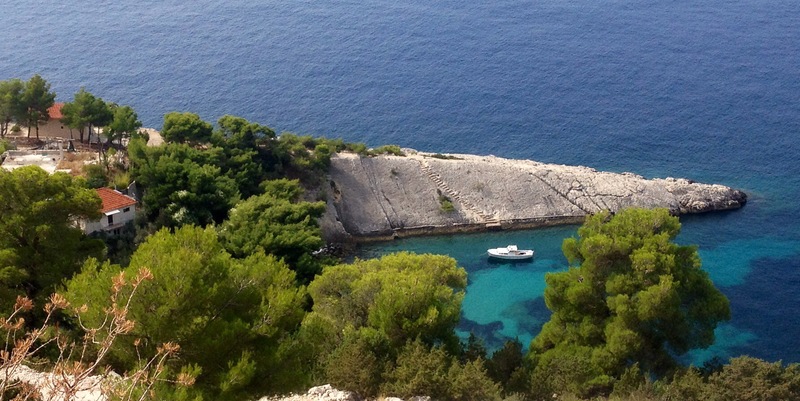 So I want to go to another island, KORCULA. 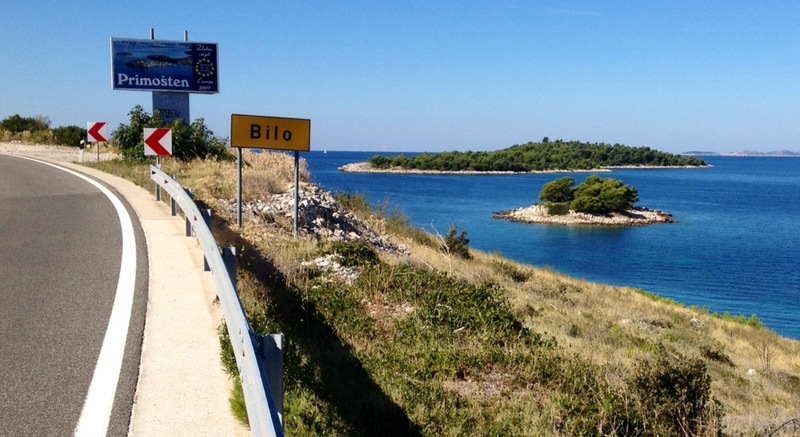 The ferry from Hvar doesn’t allow bikes. 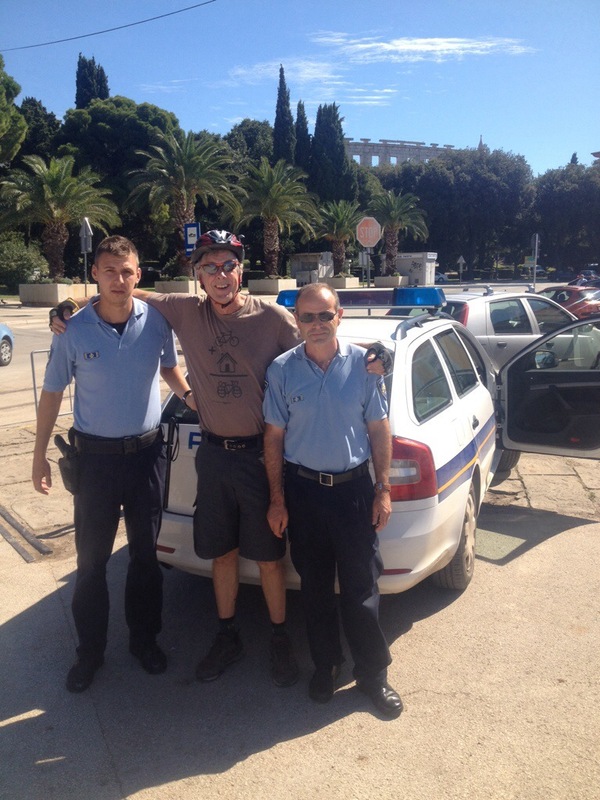 But if I ride to STARI GRAD there is a ferry twice a week that I can put my bike on without taking it apart. This worked out good. 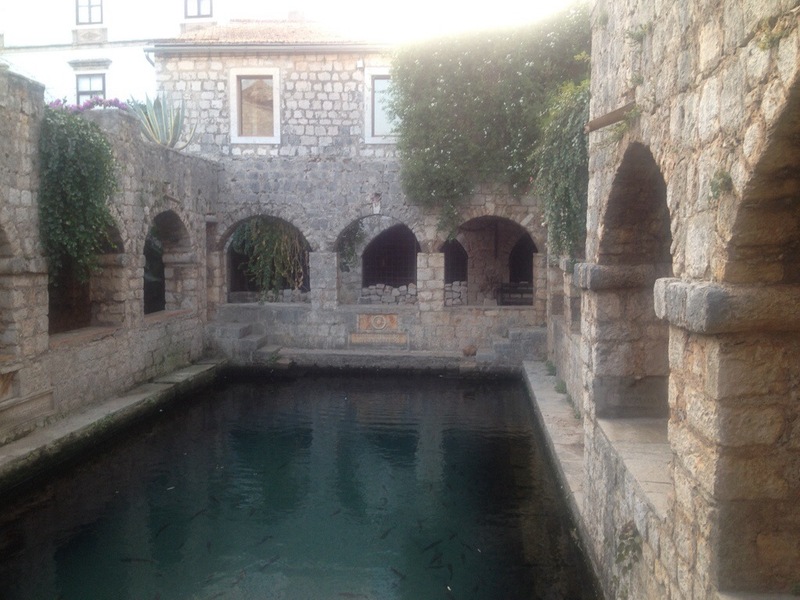 Stari Grad is a Unesco protected village and one of the oldest cities in the Mediterranean, 2400 years old. 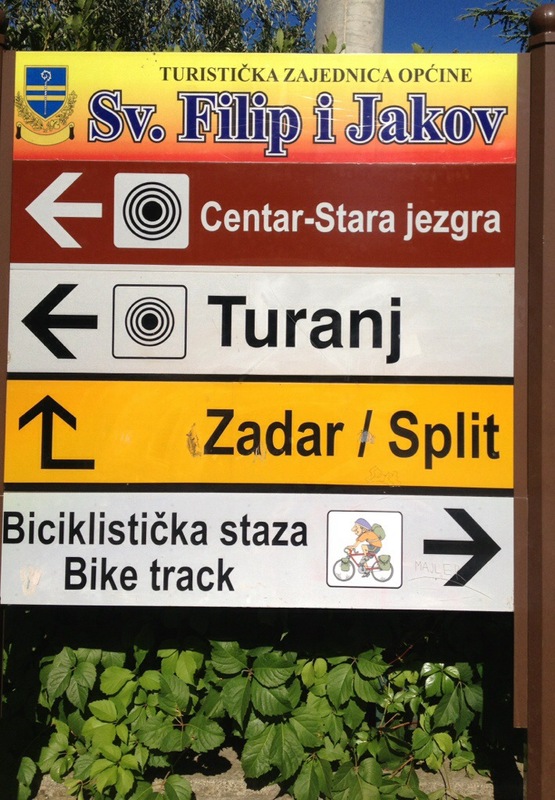 So I decide to bike over the mountain to Stari Grad. THE VIEWS FROM THE ROAD NEVER CEASE TO AMAZE ME. Your not suppose to ride your bike through the tunnel, I have one question “How do I get to the other side?” I rode and this photo is taken after I biked it. 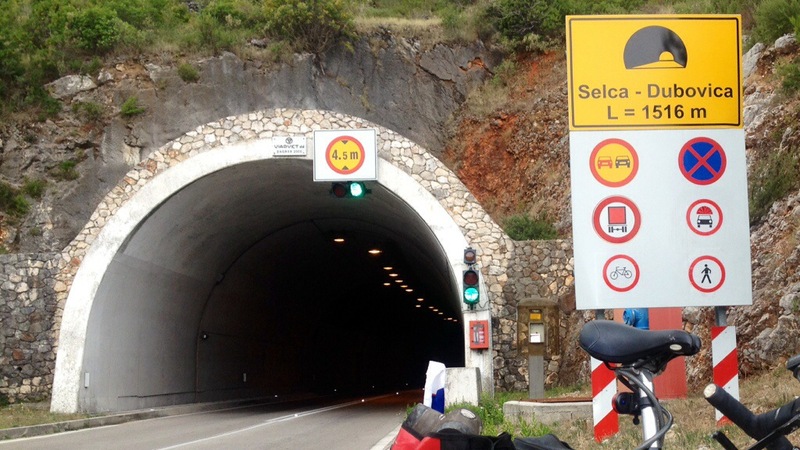 Motorcycles sounded like semi-trucks in the tunnel. THE TUNNEL IS ABOUT A MILE LONG. FORTRESS TVRDALJ had a fish pond in the court yard which is tied to the sea to exchange the water. 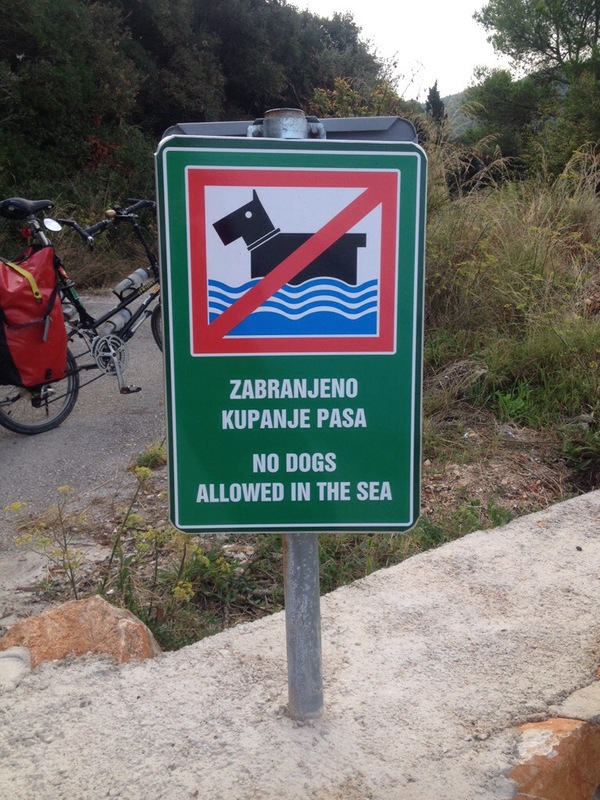 BEING AN OLD CITY, THERE IS A NON-EXISTENT SEWER SYSTEM, SO KEEP YOUR DOG OUT OF THE OCEAN NEAR TOWN. 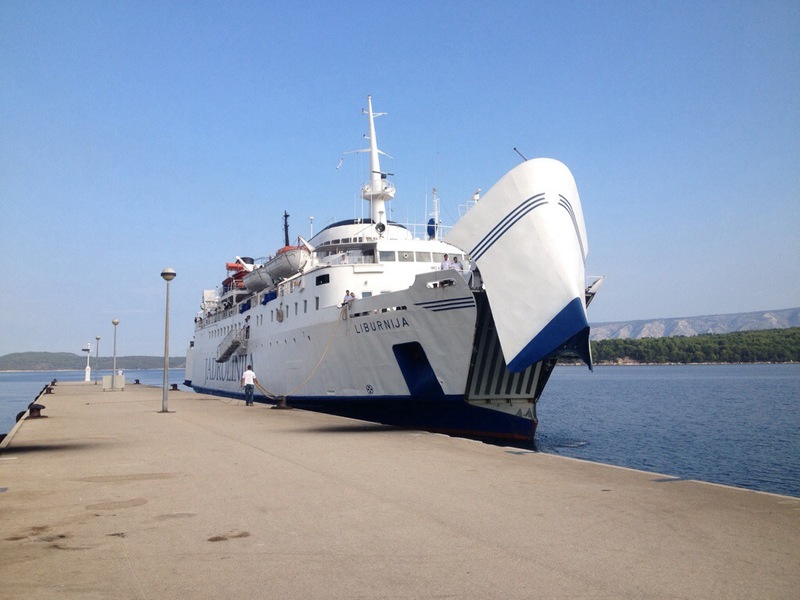 THIS IS MY FERRY TO THE ISLAND OF KORCULA, THIS REMINDED ME OF A BOND MOVIE. 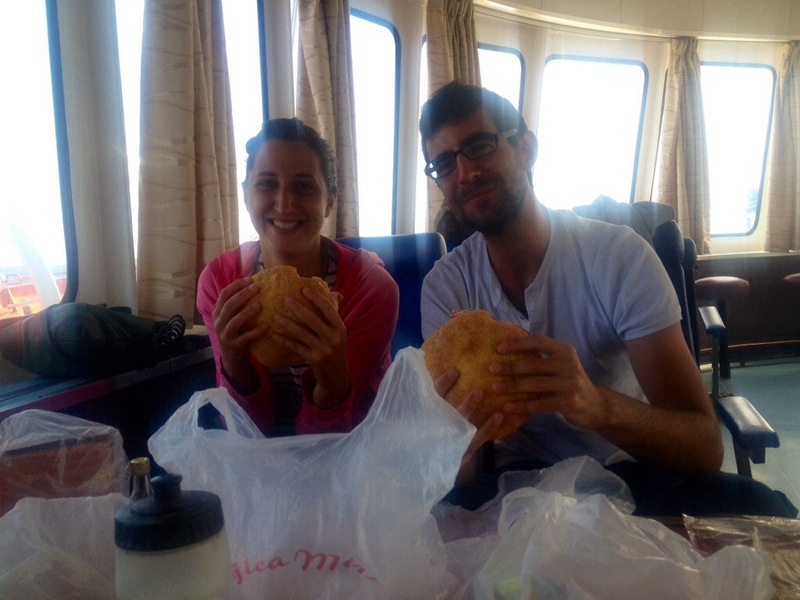 I sat with this French couple on the ferry, they were making the worlds largest sandwiches (American style). THEY COUNTED THE SLICES OF HAM IN THE PACKAGE, I’M NOT SURE WHY? SO THEY BOTH GOT THE SAME AMOUNT OR THAT THERE WAS AN EVEN AMOUNT FOR ANOTHER SANDWICH? 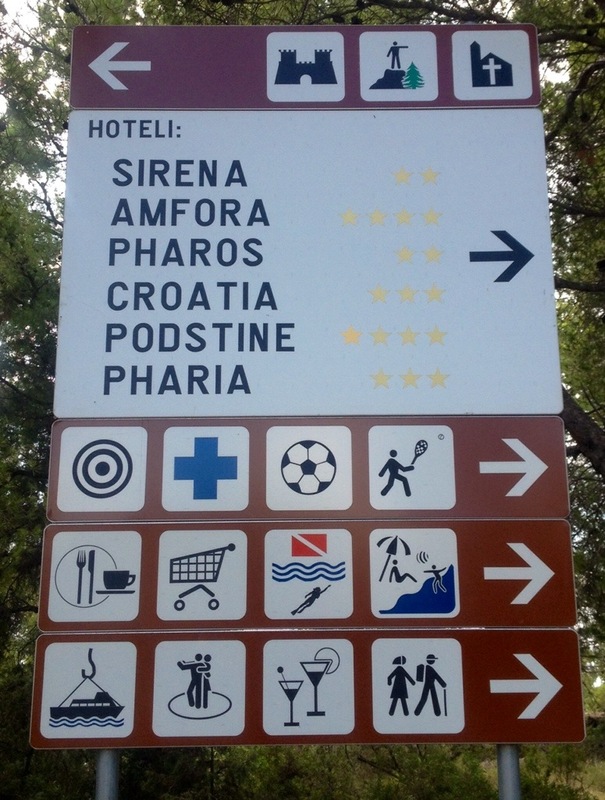 I am at the island of KORCULA. The weather forecast is for rain 100%. An apartment cost $2 more than camping, easy apartment. So here I am working on the blog. 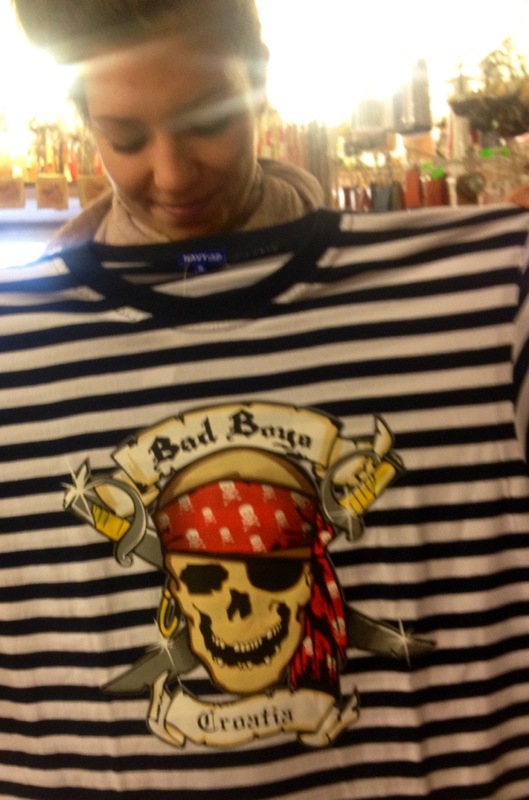 (good boy). It’s Sunday and the town is closed. NEXT? DUBROVNIK IS IT REALLY AS GREAT A CITY AS THEY SAY? WE’LL SEE. 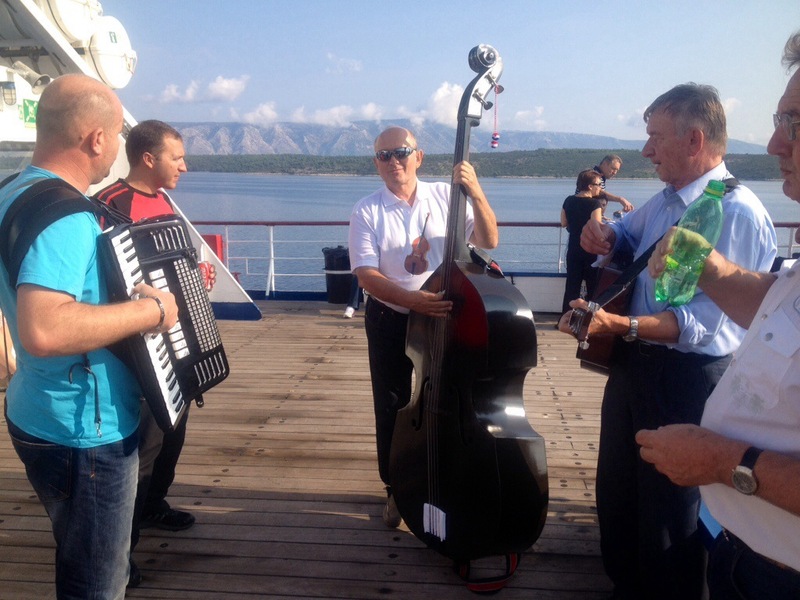 CROATIAN PHOTO STREAM IS HERE ENJOY! 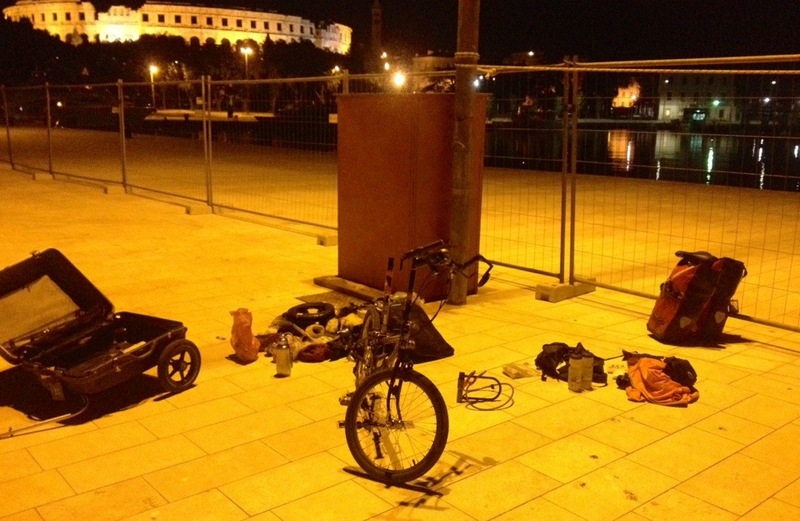 This entry was posted in CROATIA, Uncategorized on September 29, 2013 by jeffsbiketour. Jeff, we’re in Dubrovnik tonight!! Where are you???? Jeff, you are missing days of torrential rail and wind. It is really coming down right now. The jet stream blew the remnants of a typhoon from Japan. Is the rain radioactive, I wonder? Will get out this week to see if it is time to pick the apples. The trees did not do so well with my transplanting them last year though they did put on some apples. I think maybe I’ll make some apple sauce and stick it in the freezer. Yum. Weekends sure fly by fast! Looks like the weather is holding nicely for you and what cool pictures. Glad to see you got your police shots.